How often have you heard someone in love explain their attraction to their beloved with some variation of that phrase? We have certainly heard it more than a couple of times at the scores of weddings we have photographed in the Washington, DC area and Northern Germany. We even say it about each other all the time. It is not always easy being married to your business partner, but our shared sense of humor has always helped us find ways to keep working side by side! We love it when couples make each other laugh, but it is not always easy to get newlyweds to do it. As we have mentioned in other posts, our approach to wedding photography can be described as photojournalistic. As much as possible, we try to blend into the background when we are taking pictures of two people tying the knot. We are there to help them tell their love story, but we always prefer that they do the narration and we the recording. If we try to create the moments, rather than letting them unfold naturally, then the resulting images will feel forced and awkward. That is why we almost never suggest to a groom that he say something to make his new spouse laugh. If it does not happen naturally and spontaneously, then so be it. With all that in mind, we always have our cameras ready for those moments when one newlywed is able to make the other crack a genuine smile and start laughing. As we mentioned above, laughter is a way that many couples express their love for one another, and it just so happens that it looks great on film when they do that. When one or both people are laughing, it shows connection. It shows that the couple is happy to be in each other’s arms and in each other’s presence. And when that is the case, it is almost impossible to take a bad wedding photo! 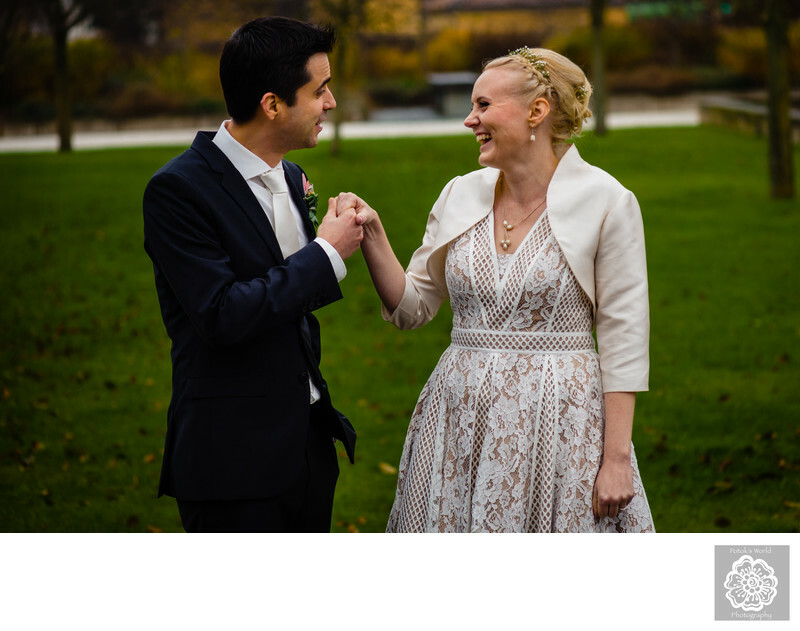 We noticed that these particular newlyweds shared similar senses of humor almost as soon as we began photographing their wedding at the luxurious Hardenbergesches Haus in Hannover, Germany. The day had clearly been a long and hectic one for them. The bride’s family had flown in from South Africa for the marriage celebrations, and there was a lot to do to make sure everyone was settled properly and that all the arrangements for the nuptials were taken care of. Throughout everything, however, throughout all the running around attending to things, the bride and groom kept finding their way back to one another for a quick cuddle and a whispered word or two that invariably elicited a smile. We were so happy, then, when they did the same things during the couples portraits portion of the day and we were able to get more of those moments on film. Once they had a little privacy and time to themselves, they could not stop smiling and giggling at their own private jokes. The connection between the two was always there, and once they were free of distractions, that bond shone through in every shot. Location: Hardenbergsches Haus, Alte Herrenhäuser Str. 10, 30419 Hannover .